Additional Info: Washing Machine, Dishwasher and Boat to use on lake. Non refundable deposit is required at time of booking. This beautiful Chalet is situated in a quiet cul-de-sac with lovely views from lounge and bedroom overlooking the main lake. 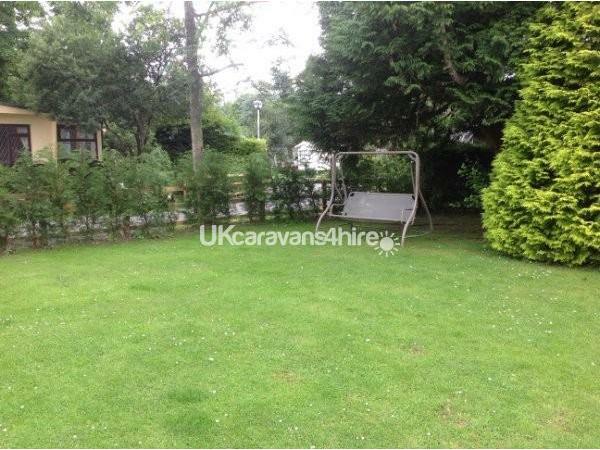 It has a large secluded garden area which is ideal for children and is only a short walk to the complex. An added attraction is a boat which can be used on the lake at any time free of charge. 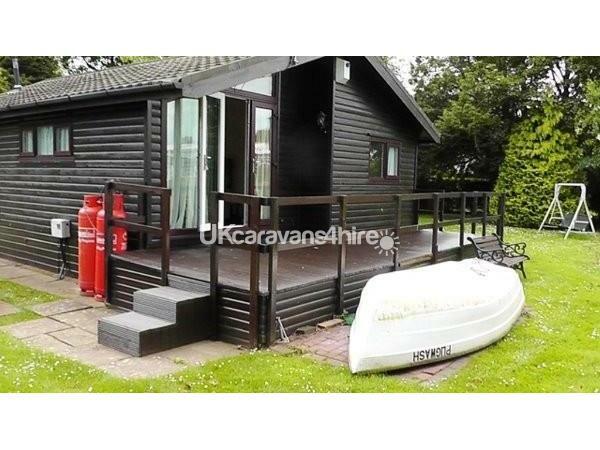 The Chalet is fitted with central heating and double glazing throughout and also includes washing machine and dishwasher. 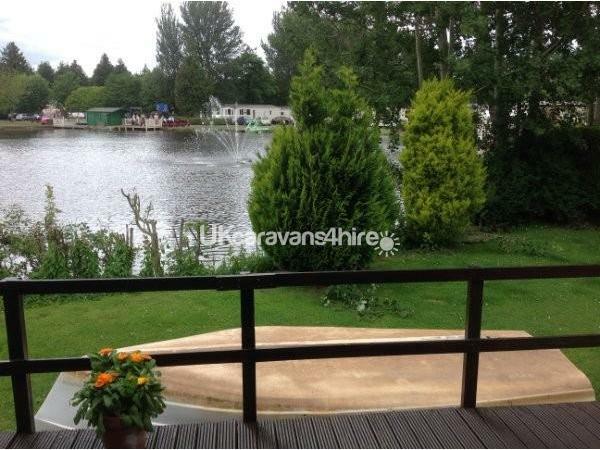 Haggerston Castle is a five star park with seven lakes & acres of woodland & wildlife. We just came back from this beautiful home from home. It's a credit to lesley. You could not want for anything at all. From first contacting lesley for availability I thought of her as a friend. She is SO lovely. Even to checking via txt that everything was in order for our stay. It's beautifully decorated. The kitchen and lounge fabulous. The bedrooms just as beautiful. The beds very comfortable. We wouldn't stay anywhere else now we've found such a beautiful roomy place to stay for a holiday. Haggerston Castle Holiday Park has everything you need. From various food to entertainment and activities. We'll definately come again bringing the grand-children. They will have lots to do. The daily activitis are fantastic throughout the day. We would recommend staying here to anyone. Thanks once again lesley. Just back from a fantastic stay. 4 nights in this beautiful accommodation, immaculate, all the essentials for our visit. Highly recommend this lodge. Great service from Lesley. Can't wait to visit again! Have just returned from a lovely break in this amazing chalet it had everything we needed, a real home from home and the garden was perfect for our dog and boy with special needs ,he loved it . Been to Haggerston many times and now wouldn't go to any other accommodation. Lesley was very helpful when booking and made sure all was ok on arrival. Will definitely be booking again . What a fantastic little chalet. The quiet cul-de-sac made you forget you were in a caravan park. The view from the decking was beautiful, looking into the lake, great for people watching. We Luved the space inside and the rooms were excellent size. We so Luved our stay and will definitely be returning. The chalet and position of it made us feel as if we were in Centre Parcs not haggerston. A big thank you to ann who made us feel like part of the family. Absolutley amazing chalet. 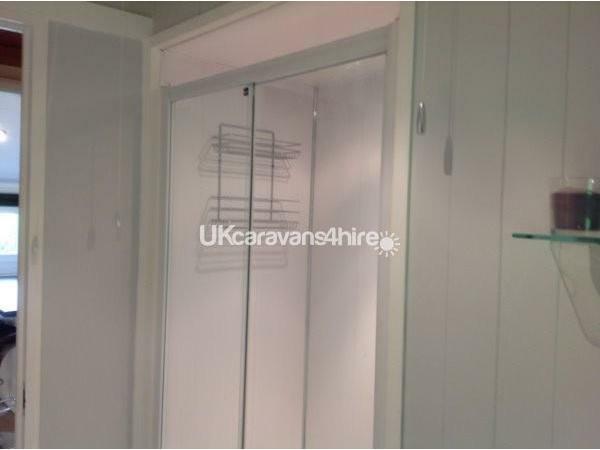 Very homely & has literally has everything you need. We stopped in July for my little girls birthday and had a fantastic time. We have already booked for October & next July. The site has something for every age. The owner Anne is really kind & friendly & very easy to reach if need be. The staff and facilities on site are also excellent. We love it!!! Wasn't sure if we would find suitable accommodation as we were only able to book from sat-mon, however Ann kindly let us book for the 2 nights - something I am sure other owners would not have done! Ann also provided us with a day pass for all the family which was very much appreciated. On to the chalet... one word STUNNING!!!! I had regularly looked at pictures online but even they didn't do this wonderful chalet justice. It is absolutely gorgeous and a definite home from home. Our only regret was that we weren't able to stay longer. Even just staying for 2 nights allowed us time to relax. Sitting in the chalet at night with the curtains open, heating on, looking over the lake really was lovely. The chalet has absolutely everything you could ever want/need and more! The beds are so comfortable and the living area perfect. I couldn't believe the size of the private garden and we were lucky that the weather stayed dry so even managed a wee seat on the outdoor swing with a cocktail or two..bliss! Having plenty of room for our dog outside was an added bonus and she loved running around without being annoyed by other dogs (as she can be a bit nervous). Ann is the perfect hostess and made us feel welcome from the moment we booked to the moment we left. Would never book a caravan at Haggerston again... it simply wouldn't be the same!! Looking forward to booking again for the summer - thank you again Ann. Wow Wow Wow. We have stayed here for the last 2 years and all i can say is just book it. The owner Anne is a very welcome host and is very conscientious as to the well being of her guests. This well designed swiss type lodge (Anne calls it a chalet but it seems like a lodge to me) has so many home comforts and many more little extras including a very spacious garden overlooking the lake great for football, frisbee etc. Great quiet location on park with main complex easily accessible. Take my advice don't book through Haven stick with Anne she will do you proud. She could charge a lot more but by her own admission doesn't want to be greedy. we're going back next year for sure. LOVELY AND HOMELY. HAS EVERYTHING YOU NEED IN IT. BEDS COMFY. GREAT SHOWER. MY SON LOVED THE IT. CANT FAULT IT ONE BIT. BOOKED UP AGAIN FOR NEXT YEAR. WAS GREAT BEING NEXT TO LAKE. LOVELY VUE. THANKS AGAIN ANN. WAS A PLEASURE MEETING YOU ON ARRIVAL AND WHEN DEPARTING.